As I have noted before, Jon Jones is too tall and elusive for dirty boxing to work, and uppercuts are not effective against an opponent whose head is not at least eye-level with your own head. However, in the sequence above, Daniel Cormier was able to deflect Jon’s left hand (photo 2) and go for the neck tie. He was able to land solid uppercuts on Jones as Jon was out of balance and was unable to posture up or clinch. Posted by EMBRACINGTHEGRIND at 9:24 π.μ. Kostas is currently a blogger/ fight analyst for Bloodyelbow.com , one of the most popular MMA websites in the world. 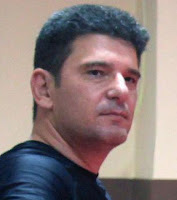 This website reflects his personal views on martial arts related topics including but not limited to MMA, BJJ, Muay Thai wrestling and philosophy. If you would like to publish upcoming articles on your website please contact Kostas on Facebook or e-mail. Please share on social media to spread the love.